Kill Shot Bravo: Sniper FPS is a Free-to-play, Action Shooter game for mobile phones and tablets. Arm yourself with deadly assassin sniper weapons, assault rifles, machine guns and the latest military gear to complete covert combat missions deep inside enemy territory. Interact with your surroundings and capitalize on points of interactivity to unleash devastating attacks on your enemy, and scout out for the best vantage points to snipe the remainder away with ease. Make good use of vehicles for an even better chance of offing the enemy, from helicopters to army jeeps. There’s a range of mission types to take part on, each with their own types of achievement and rules. Breach missions require the player to infiltrate hostage situations and take out the enemy in record time, with more conventional battles where players must take out as many enemy soldiers as possible. 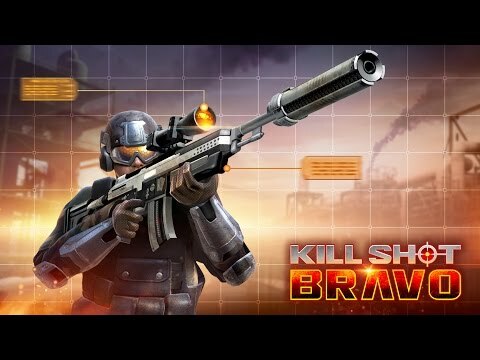 Play Kill Shot Bravo Mobile alone, or head online for co-operative campaigns. Kill Shot Bravo Mobile offers realistic graphics, dynamic sound effects and smooth playback across most device types. Rated PEGI 17, this is one best left for older players, with scenes if violence and bloodshed that are unsuitable for little ones. Play the #1 FPS shooting sniper game on mobile. Go to war with the enemy and prove your sniper skills in the king of 3D sniper games.